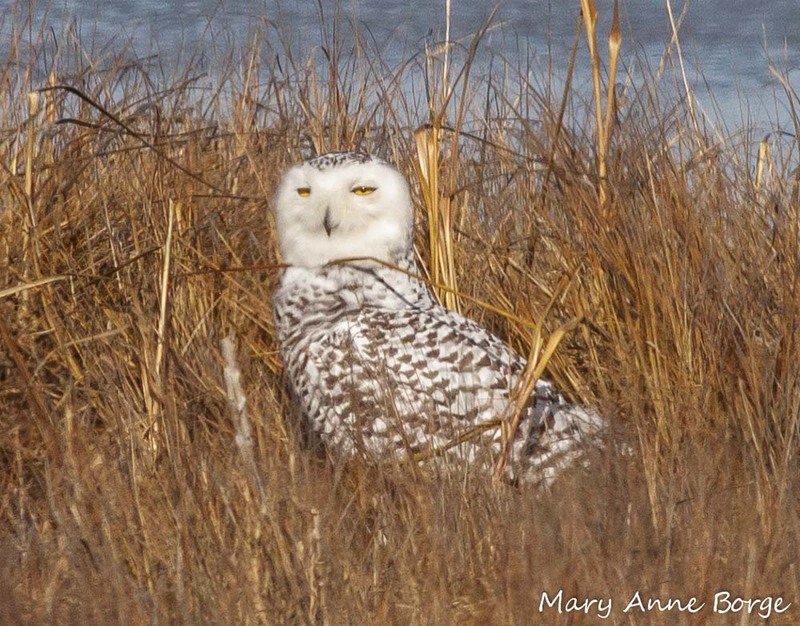 Like every other birder in North America, we decided that this winter was the best chance we would ever have to see a Snowy Owl. So we went to Forsythe National Wildlife Refuge at the Jersey shore, the location near here likely to be the most reliable for finding them. 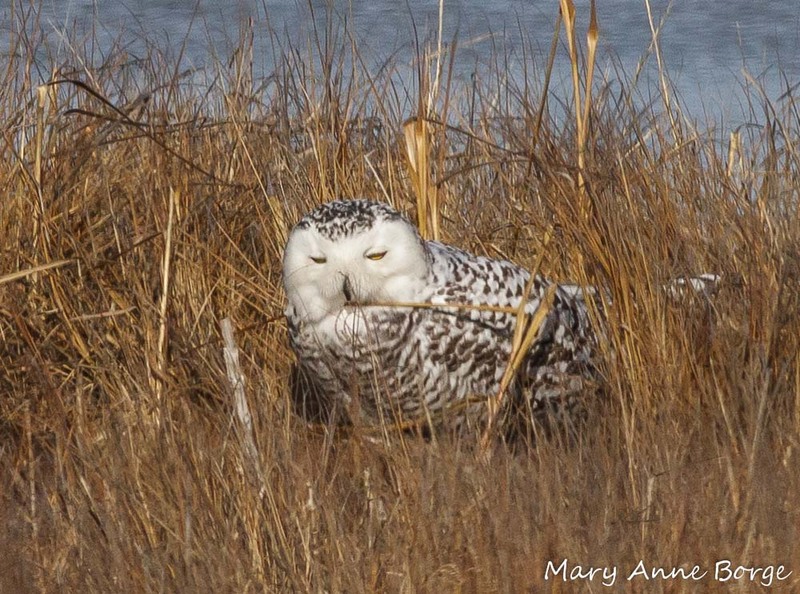 There were a number of other birders who had the same idea, and the way we spotted the owl was to look across the marsh from where about a dozen cars were parked, their occupants outside with binoculars, scopes and cameras ready. We joined them. 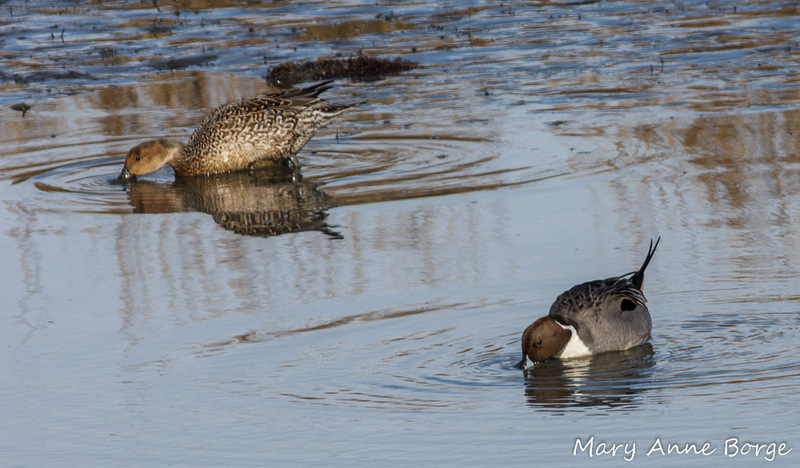 Fortunately for the bird, she was quite a distance away, probably more than a hundred yards, with water and marsh grasses between her and her admirers. She seemed to be undisturbed by the attention she was getting. 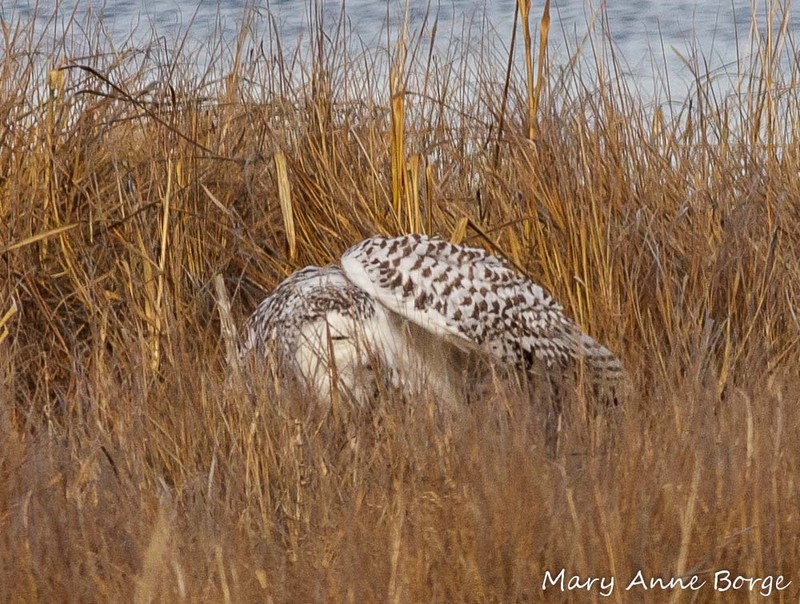 She spent much of her time alertly swiveling her head from side to side, often with her eyes partly or mostly closed; her hearing may have been a more important tool in monitoring her surroundings. At one point she looked ready for a nap. Forsythe is always a productive birding spot. 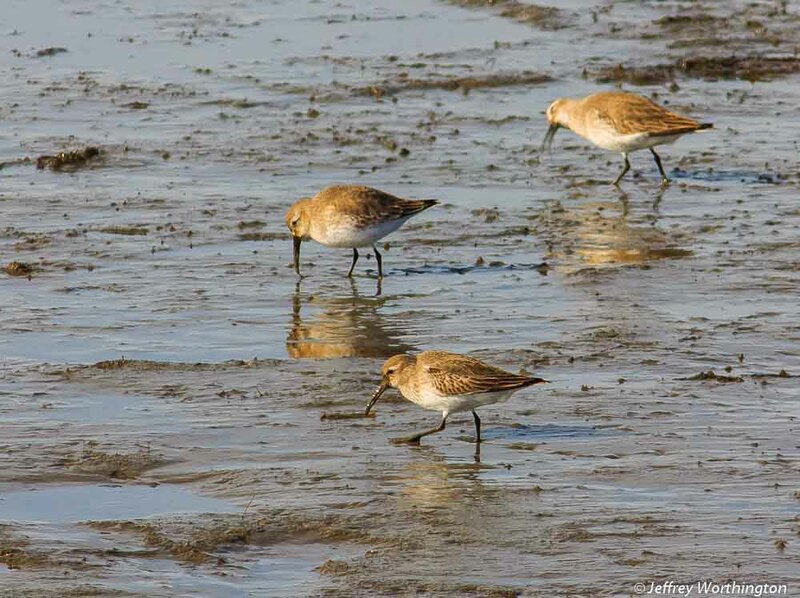 On this day, Northern Harriers hunted the marshes, and flocks of Dunlins fed together in the mud flats. 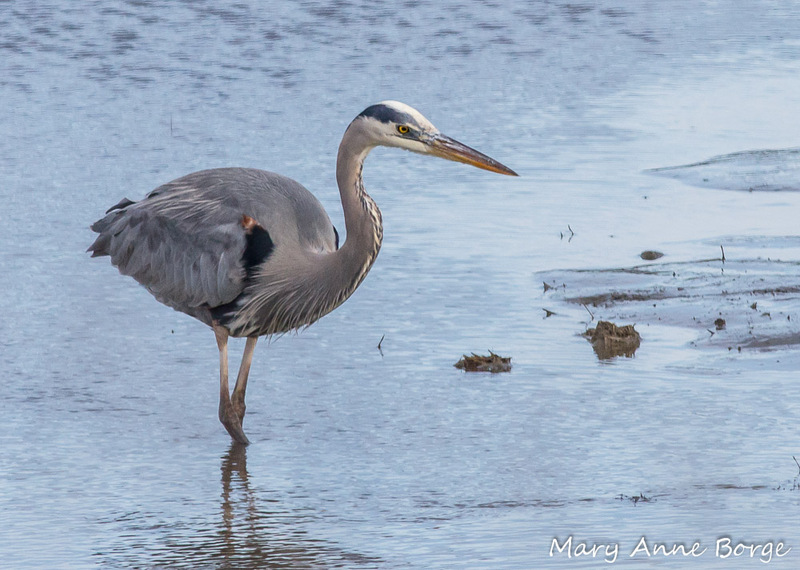 Great Blue Herons hunted in the channels along side the road. 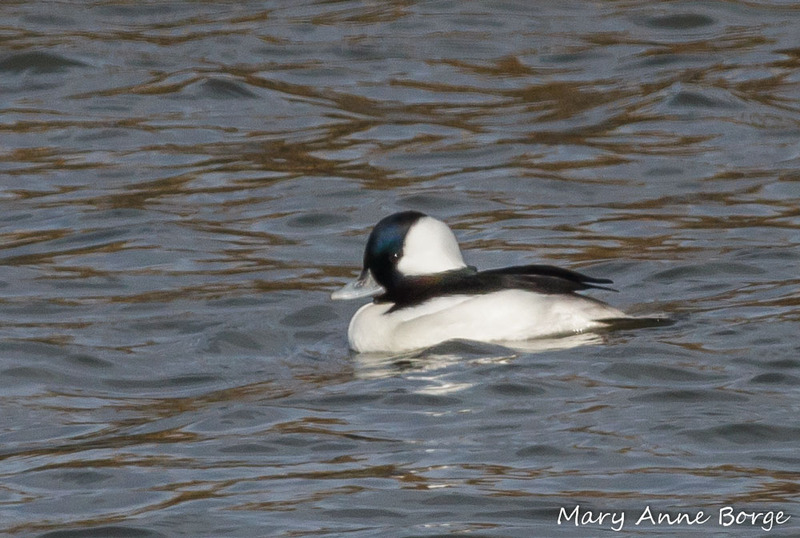 So did a few Buffleheads. Seeing this pair of Hooded Mergansers was a treat for me. 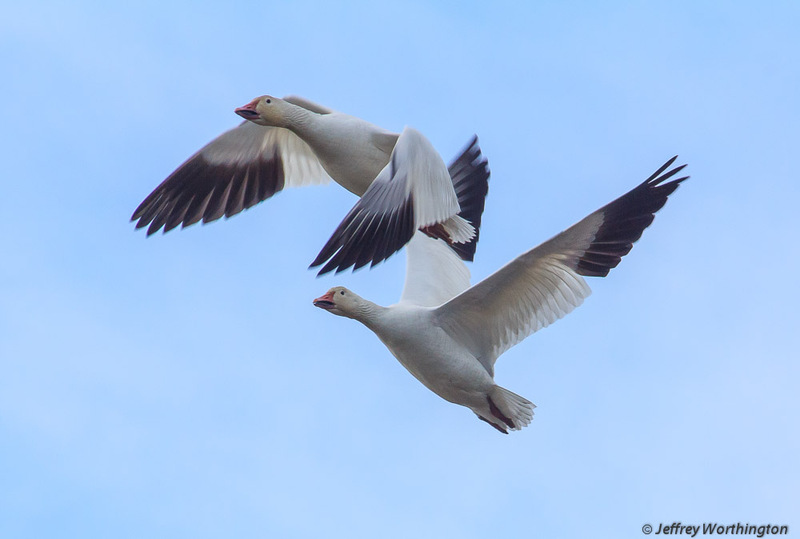 Hundreds of Snow Geese flocked together in the ponds and marshes. 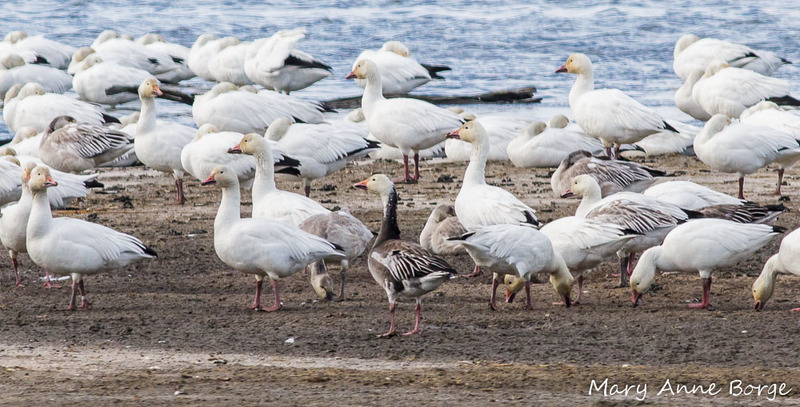 Even a dark morph Snow Goose was present. 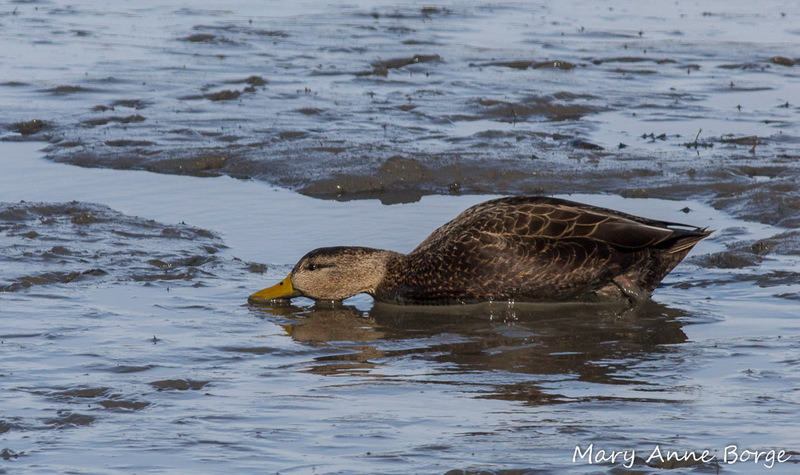 Flocks of American Black Ducks swam in the pools, dipping their beaks just below the water surface searching for food. 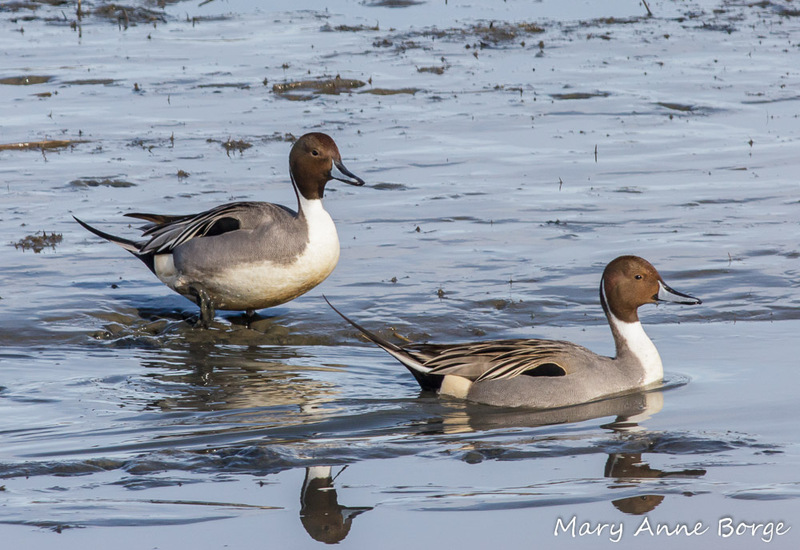 Northern Pintails fed together in the shallow streams. 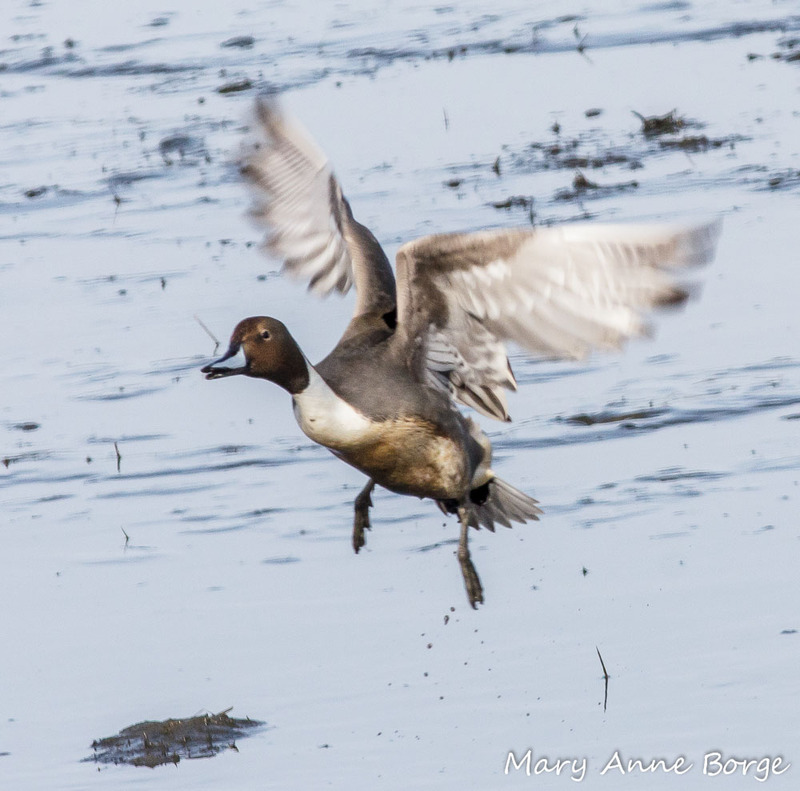 This entry was posted in Birds and tagged American Black Duck, Forsythe National Wildlife Refuge, Great Blue Heron, Hooded Mergansers, northern pintails, Snowy Owl by Mary Anne Borge. Bookmark the permalink. Thanks, Joyce! I admit we went to Forsythe on one of the rare warm, dry days. 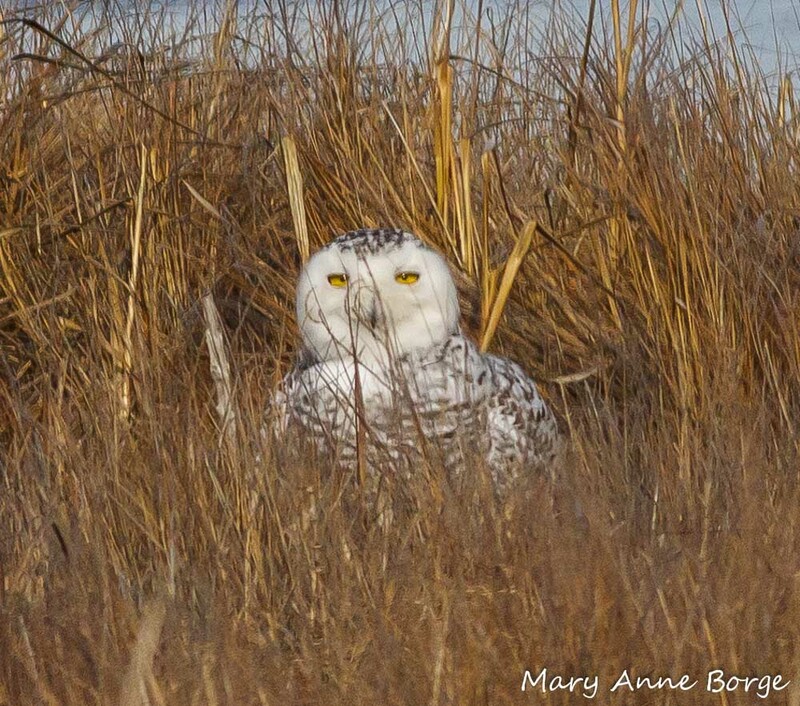 What a beautiful picture of a snowy owl! I learn so much from your blog. I am glad to see you are linked up to Bowman’s Wildflower Preserve – a perfect match. Thanks, Kathy! See you soon. 🙂 AWESOME!!!! 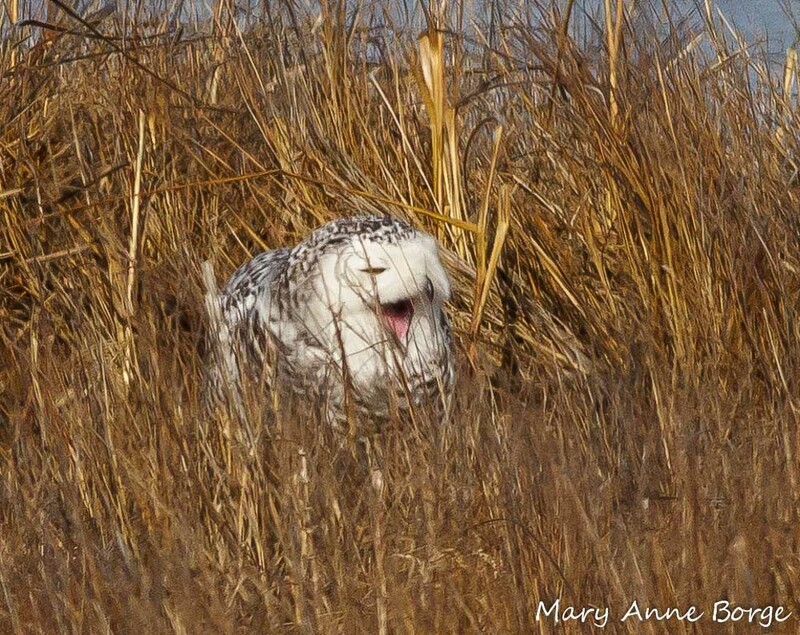 !….I went on the bird watching trip with Merc and SLNC…..it was alot of fun and the only one I don’t remember seeing is the Owl….thanks! Thanks! 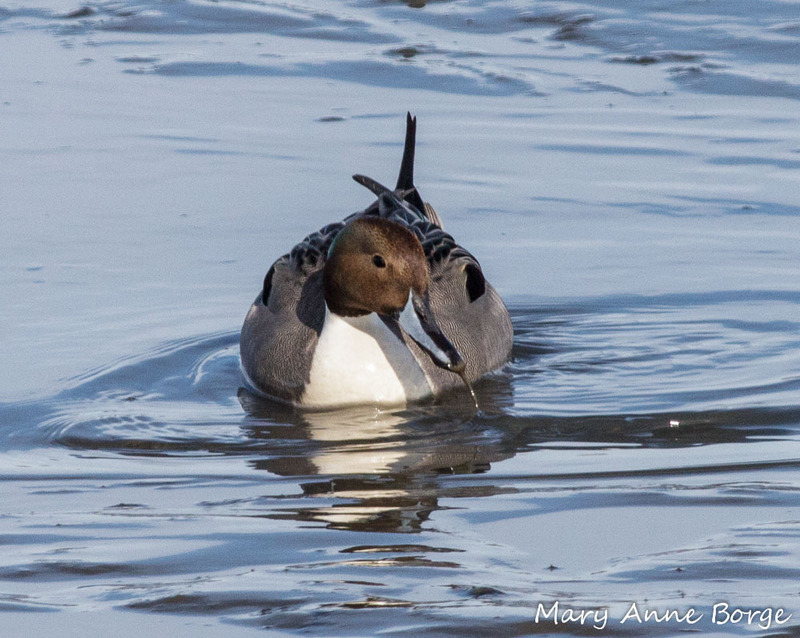 Forsythe NWR is really a great place for birds. Great photos of all the birds. What camera lens did you use for the owl shots? Thanks! I’m glad you liked the photos. I use a Canon Rebel t3i body, and I used a 400mm lens for all the shots in this post. I cropped many of the photos later using Lightroom. These photos seem to give the birds personality. Love all the dimensions you capture with the water, too. Thanks, Elaine. I think the birds have personality. I’m glad I was able to capture a little bit of it. Gorgeous pictures as always! We love going to Brig. 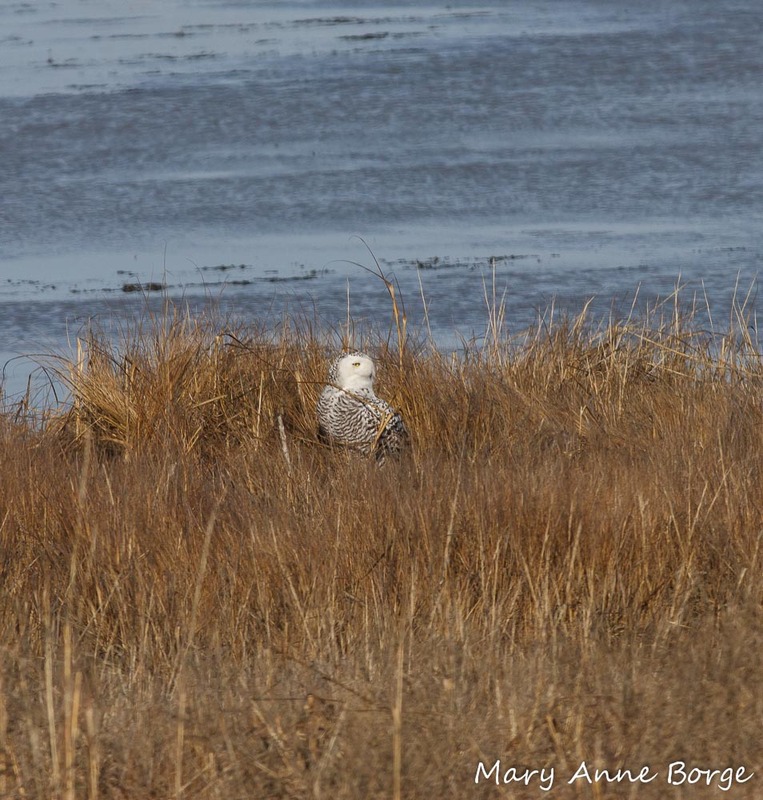 Saw a snowy owl there just before the holidays. Sounds like an excellent outing! I’m jealous of anyone who gets shorebirds in the winter. 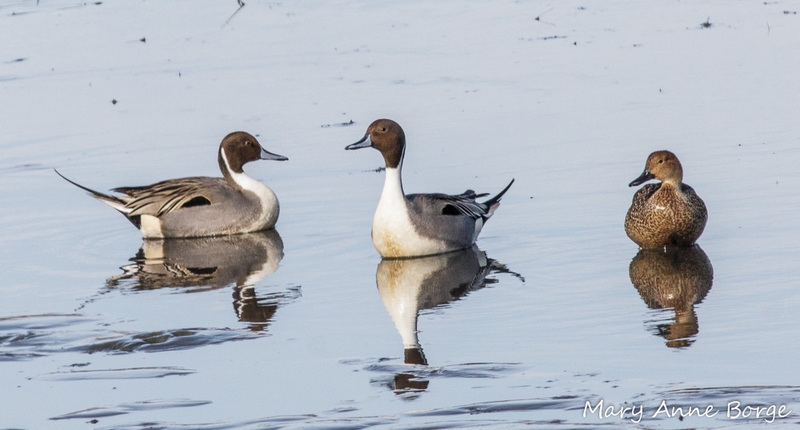 It’s too cold here for them….we have very little open water this year. Any chance of a trip down south? 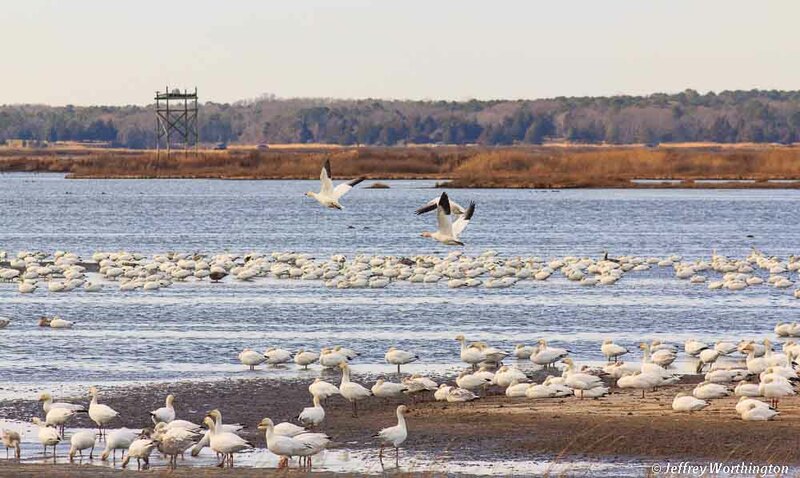 Forsythe NWR in New Jersey is great, and Bombay Hook and Prime Hook in Delaware are both terrific, too! Not this year, I’m afraid. Besides, if I go south, I want to go to Florida and see all the herons, ibises, spoonbills and egrets as well as shorebirds! I guess I’ll just have to wait until spring…should only be two more months before the Killdeer come back! Just two days ago it felt like spring here. This morning we have nearly a foot of snow and it was about 2°F. What a roller coaster winter! Oh Mary Anne, what a thrilling set of shots! 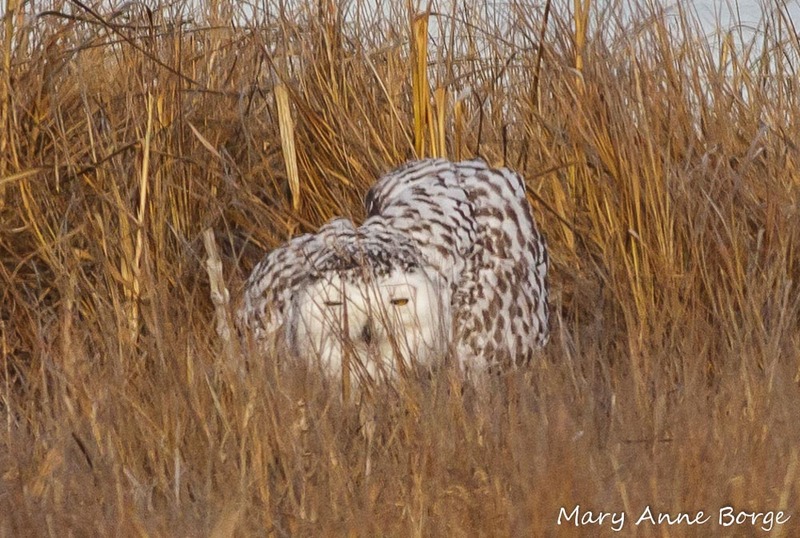 Even if I never get to see a snowy owl, at least I will have seen your amazing compositions. These are all such beautiful, detailed photographs. Congratulations, and thank you! Thanks, Monica! 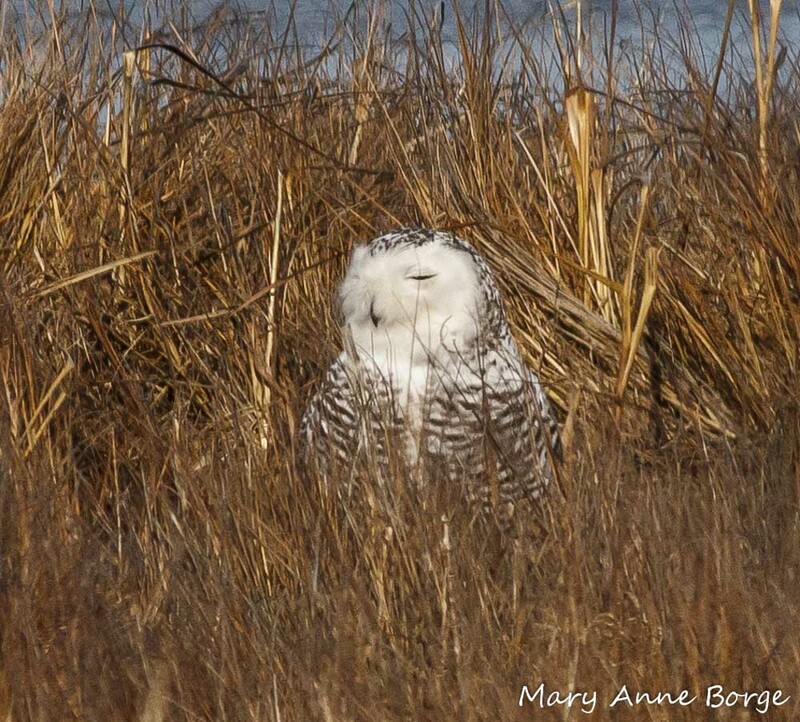 The owls have been sighted in Bucks County, too. Maybe we’ll get lucky and see a vagrant in the meadow at Bowman’s Hill Wildflower Preserve. What a thrilling set of photographs! 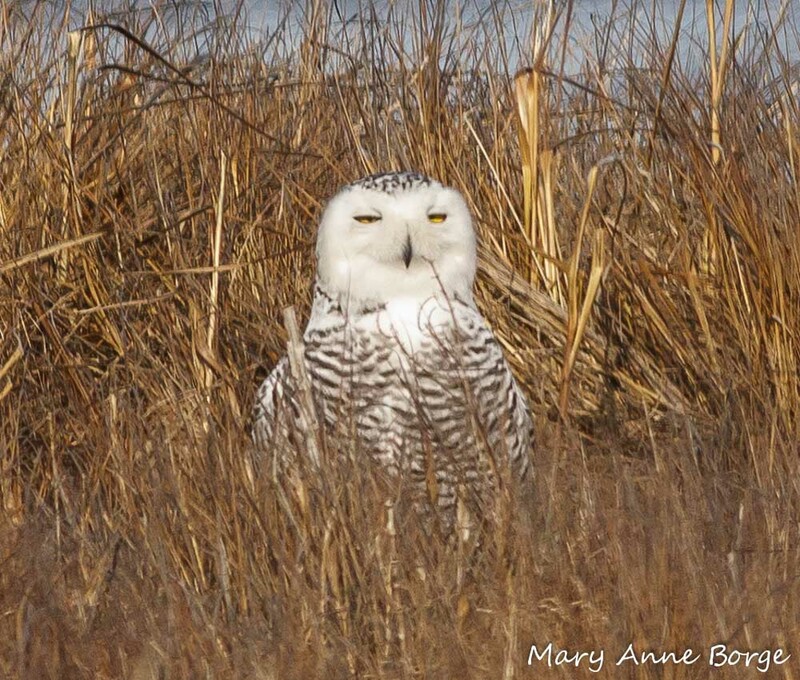 If I don’t get to see a snowy owl myself this winter, at least I’ve enjoyed your amazing detailed compositions! what wonderful shots , well done !